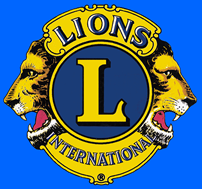 The Owensboro Lions Club provides vision exams and eyeglasses for adults and children who are in need. In collaboration with the Owensboro Help Office, the Owensboro Lions Club contributes over $14,000 toward this effort each year. People seeking eye-care assistance must first contact the Help Office. Following a screening process, the Lions Club will be contacted with the names of those individuals who qualify for financial assistance. Prisha Vaidya, a preschool student at Burns Elementary School, participates in a vision screening provided by Charlotte Arnett (left), Kidsight chairman and vice district governor for Kentucky Lions District 43E. Also pictured is Lions Club member Patricia Burch. 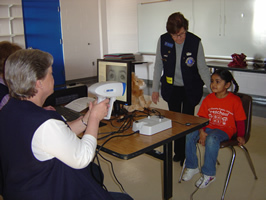 Lions Clubs, working with the Kentucky Lions Eye Foundation’s “Kidsight” program, visit local elementary schools to provide vision screenings with new equipment called a “PediaVision Camera.” The new photoscreening technology simply requires the child to look into the hand-held monitor. By assessing the way light reflects off the eye, the screening can detect whether the child is at risk for developing serious eye problems. The screenings are evaluated by trained technicians at the Kentucky Lions Eye Foundation’s lab in Louisville. Photoscreening helps identify improperly aligned eyes (strabismus); obstructions that interfere with light passing through the eye (cataracts and ptosis) that can cause amblyopia; and imperfect refractive powers of the eye (nearsightedness, farsightedness, anisometropia and astigmatism). If these conditions are identified, parents are notified and provided with listings for ophthalmologists and optometrists in our community.